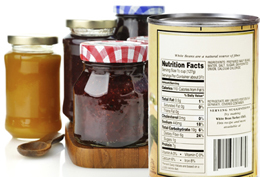 All food produced and packed for sale must meet certain State and Federal labeling requirements. There can be requirements related to the size of type that the information is printed in. Wheelwright Consultants can handle both your nutritional analysis and label design. This is a database analysis of nutrient content with FDA compliant Nutrition Facts Label for product using the finalized recipe. Includes Ingredient Statement (FDA compliant) and Allergen Statement (FALCPA compliant) for labels. Includes 2 initial options and up to 2 revisions. Client is given a disk with photos to be used for marketing. Often times it makes the most sense to have an existing food processing facility produce your product for you. This is referred to as "co-packing". We have identified a number of food processors who are interested in and capable of co-packing different products. We can help you find the correct one and meet all their requirements (some will require biological testing for shelf-life before they can be co-packed). Billed on an hourly basis. With our extensive culinary experience, we can help you standardize your production recipes so that your product is consistent. We can also develop recipes using your product(s) to help your customers understand how to use them and perhaps to use them more often!